Estimating the frequency and occurrence of rainfall extreme events is of central importance for assessing their impacts on human society and on the environment, and for designing resilient mitigation and adaptation measures. 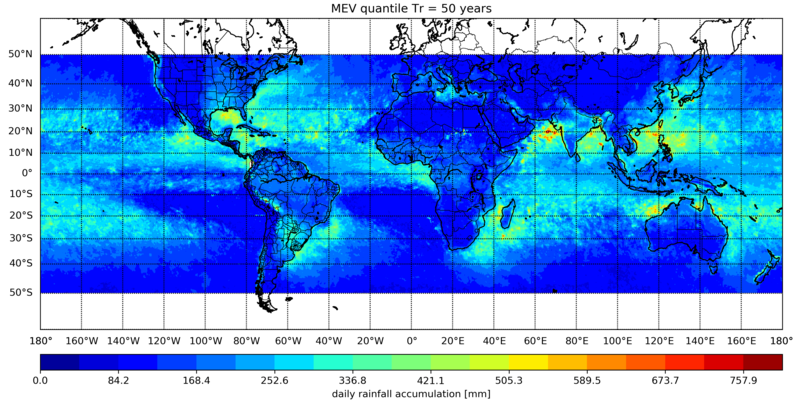 The key objective of this project is to obtain reliable estimates of extreme rainfall events magnitude and frequency using multi-sensor satellite rainfall datasets derived from the Tropical Rainfall Measurement Mission (TRMM) and the Global Precipitation Measurement (GPM) mission. Despite their short record length, the inherent limitations of space borne sensor retrievals and possible non homogeneity in the observational time series, these datasets do provide unique insight on hydrological extremes at the global scale. This information is particularly needed in many poorly gauged regions around the world. To harness these global-scale datasets, as part of this project we developed novel statistical tools which include i) a non-asymptotic model for the frequency of extreme rainfall events (Zorzetto et al., 2016) and ii) we explored the scaling properties of rainfall fields using tools from the theory of random fields, with the ultimate goal of evaluating the satellite-measured rainfall statistics in data scarce regions (Zorzetto et al., 2019). A Python package for extreme value analysis of rainfall is available on GitHub . This project is funded by the National Aeronautics and Space Administration (NASA) NESSF 17-EARTH17F-0270.